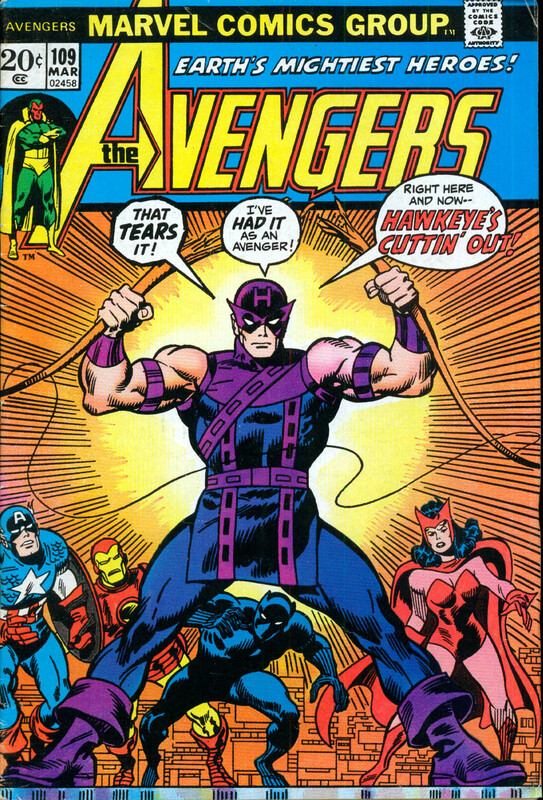 Welcome back to Avengers Week, Groove-ophiles! 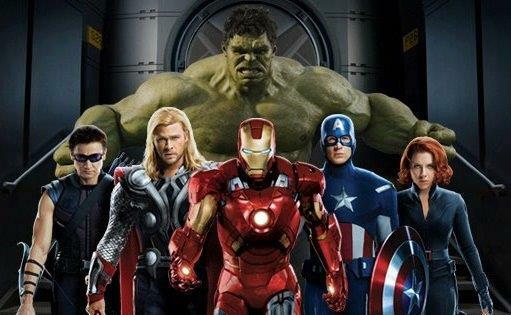 For as long as I can remember, Captain America, Thor, and Iron Man have been referred to as the Avengers' "Big Three". With this weekend's Avengers movie, I don't think there's any danger of 'em ever losing that title. 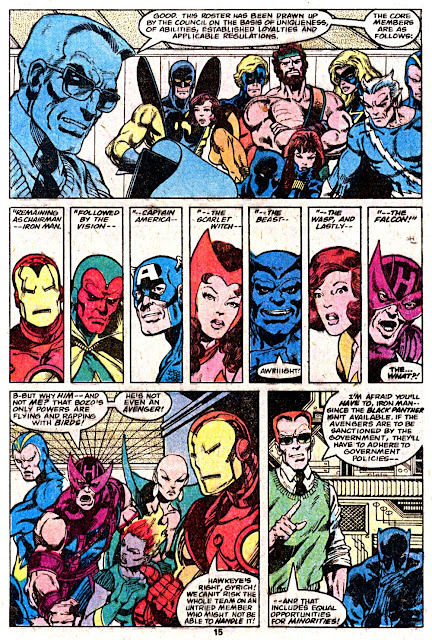 Their movies were blockbusters and paved the way for this dream-come-true-flick. However, we don't want the rest of our celluloid assemblers getting lost in the shuffle, do we? Incredible Hulk: Bruce Banner's gamma-irradiated alter-ego didn't spend a lot of time Avenging in the Groovy Age. Though he was a co-founder of the team, he was never a team player. 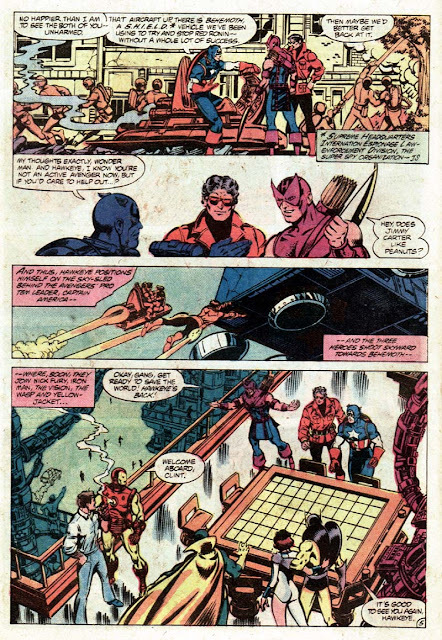 He did turn out to be a very good non-team player, as shown in most every issue of the Defenders, though. 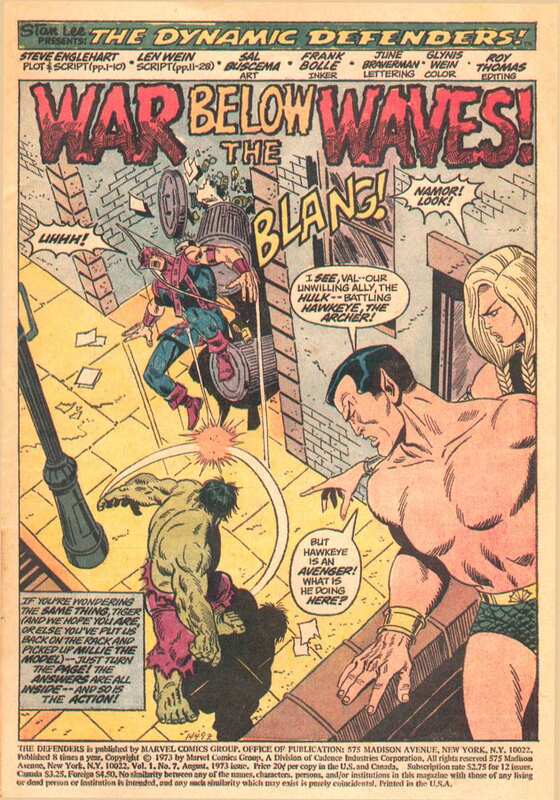 The Hulk did enjoy heavy popularity during the 70s. 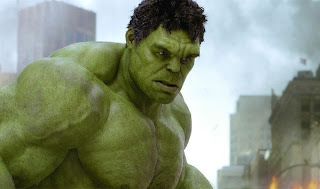 In 1976 he was awarded with his very own black and white magazine (which later went to full-spectrum color), in 1977 he conquered the small screen with the legendary Bill Bixby/Lou Ferrigno Incredible Hulk series. Ironic, ain't it? Least successful on the big screen, most successful on TV. 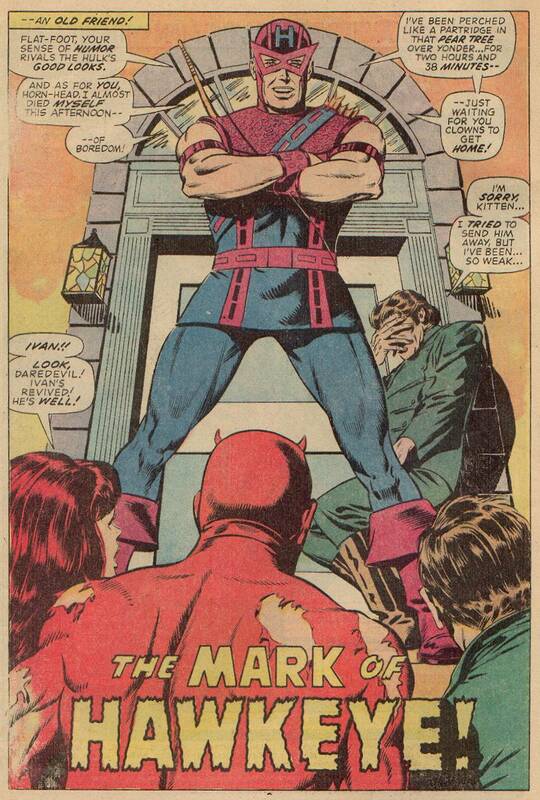 He even got his own newspaper comic strip--wait, where was I? 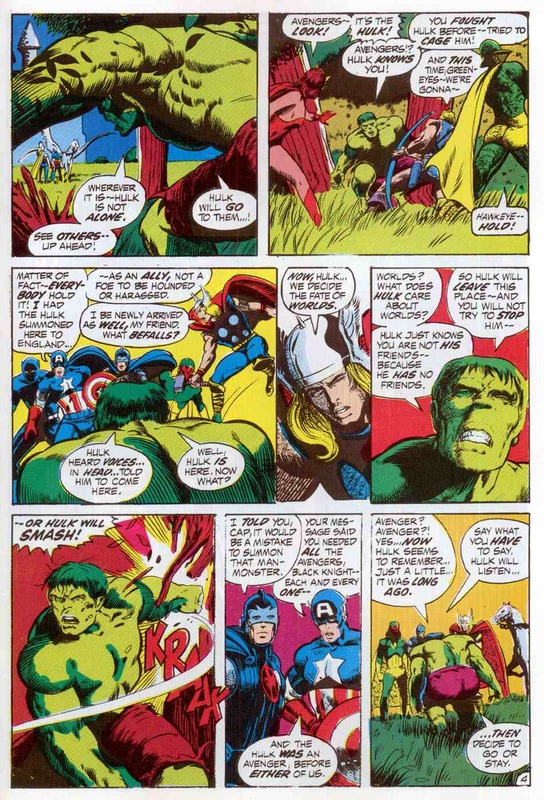 Oh yeah, the Hulk/Avengers relationship during the Groovy Age! 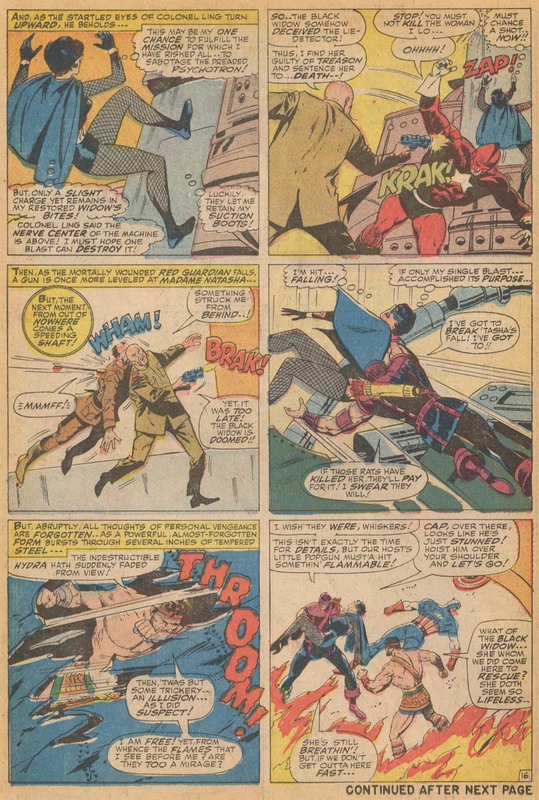 The Hulk/Avengers dynamic of the Groovy Age boils down to--with two rare exceptions...the Hulk fighting the Avengers. In Incredible Hulk #128, Hulk fought the Avengers. In Sub-Mariner #35, Hulk teamed with Subby and the Silver Surfer to fight the Avengers. 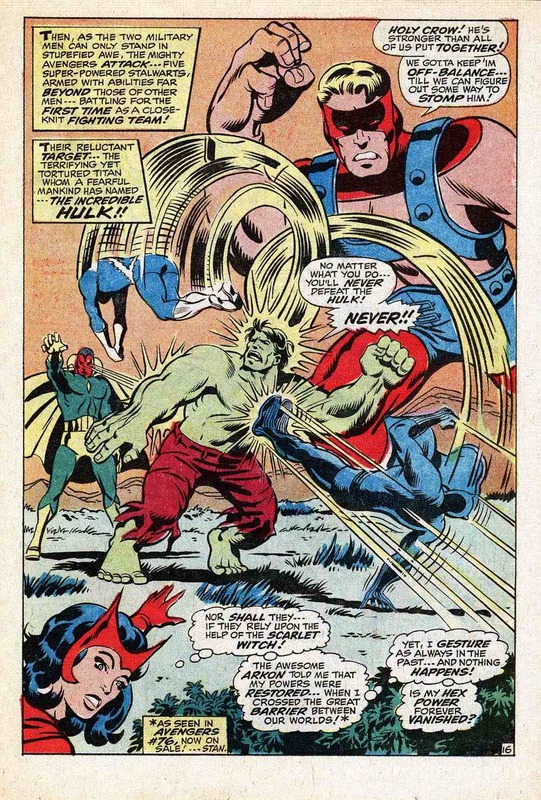 In Avengers #88, the Hulk would have fought the Avengers if the villainous Psyklop hadn't captured him first (rare exception #1). Hulk teamed with the assemblers in Avengers #100 (rare exception #2). 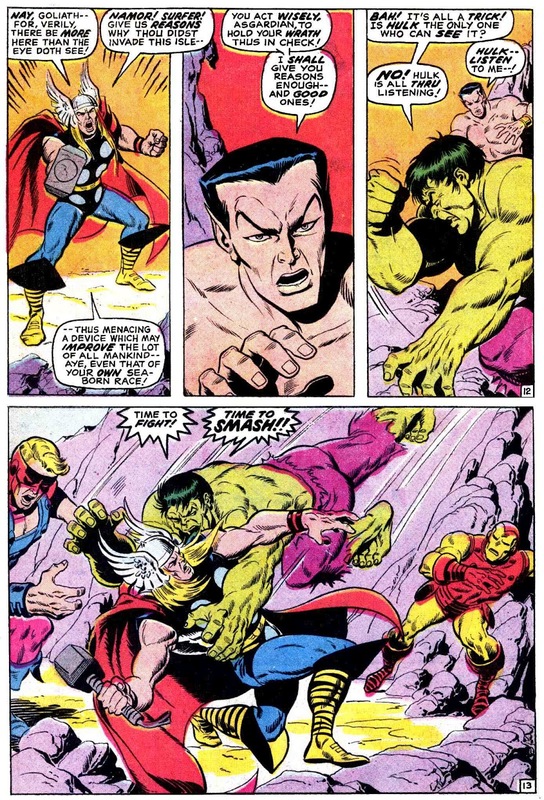 During the far-famed Avengers/Defenders clash (Avengers 116-118, Defenders 9-11), Hulk wound up teaming with the Avengers, but not after duking it out with Thor. 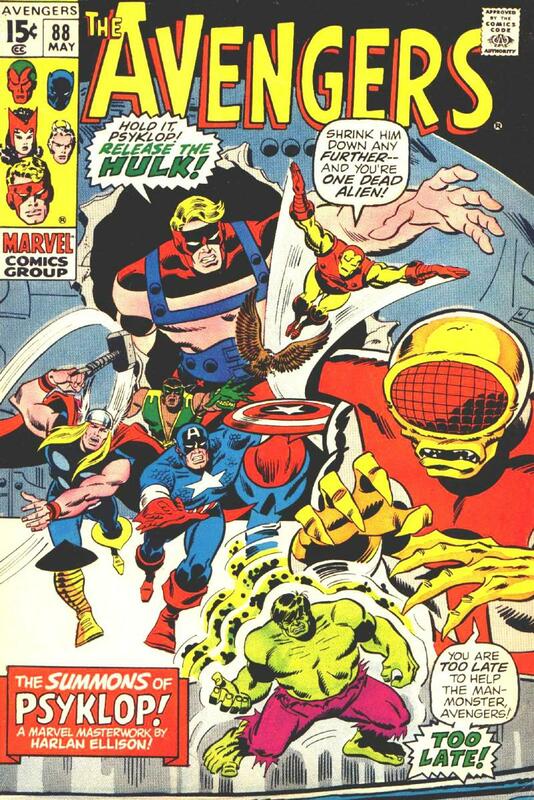 Nope, the Hulk and the Avengers definitely didn't play well together during the Groovy Age. Who knows what the new flick will bring to that relationship. 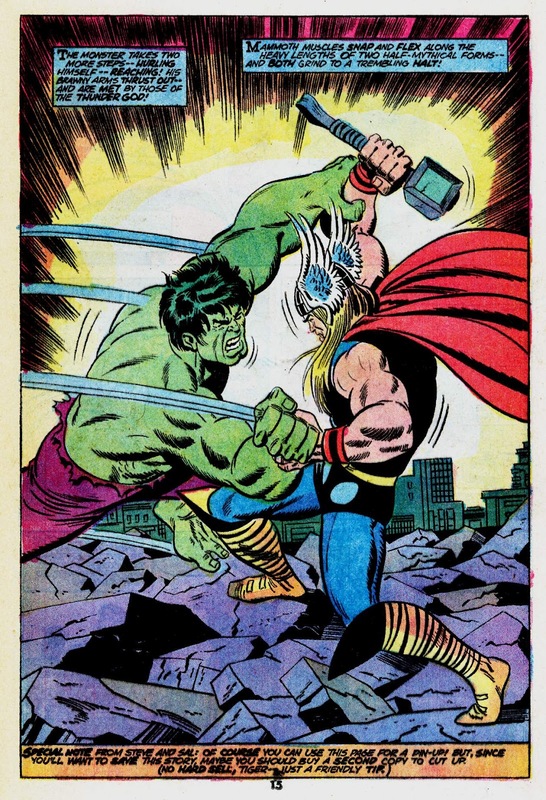 Bet Hulk and Thor throw down in it! 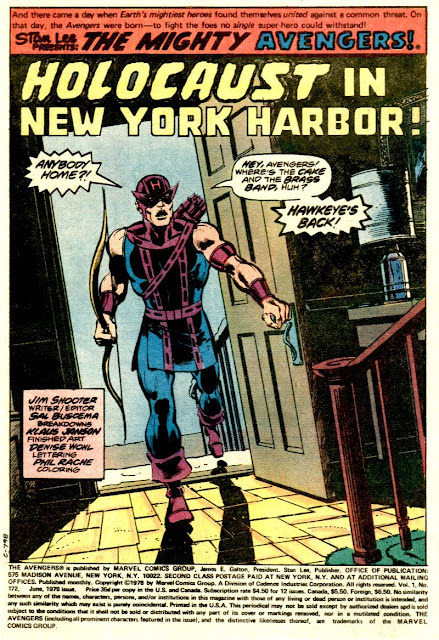 Hawkeye: Let be known that Clint Barton was my first favorite Avenger (besides Cap, natch), though when I first met him he was in the Goliath phase of his career. Why was he a fave? He was a bonehead. He was a big-mouth. He was rude and crude. He was also brave, fearless, and more human than just about any other superhero Young Groove had ever encountered. He wasn't a scientist or a soldier. 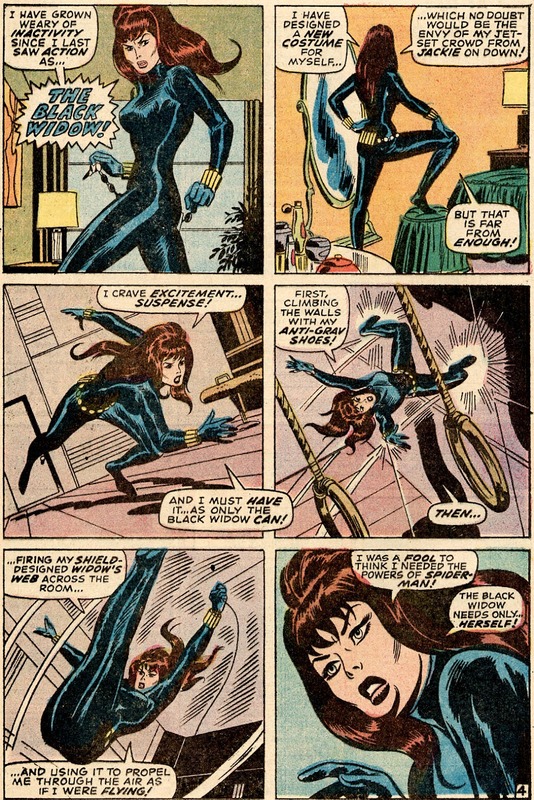 Not an alien or an acrobat. 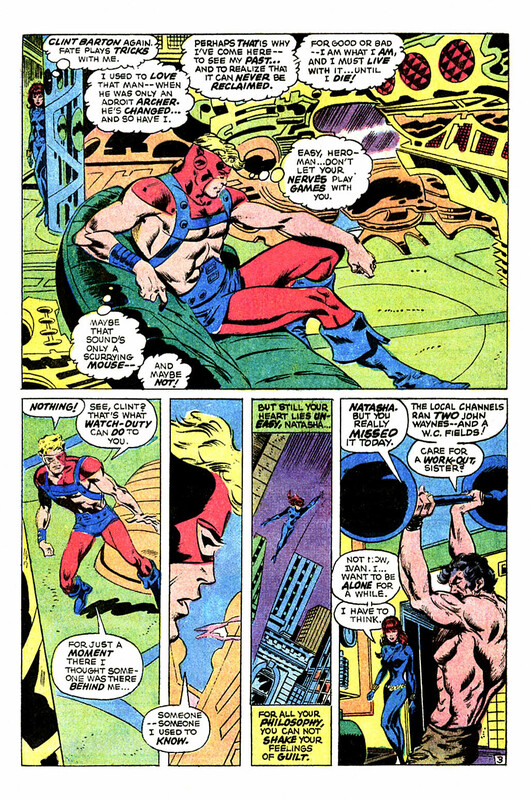 He depended on others for his "powers" (Hank Pym's growth serum when he was Goliath, Tony Stark and others for his multi-purpose arrow heads). 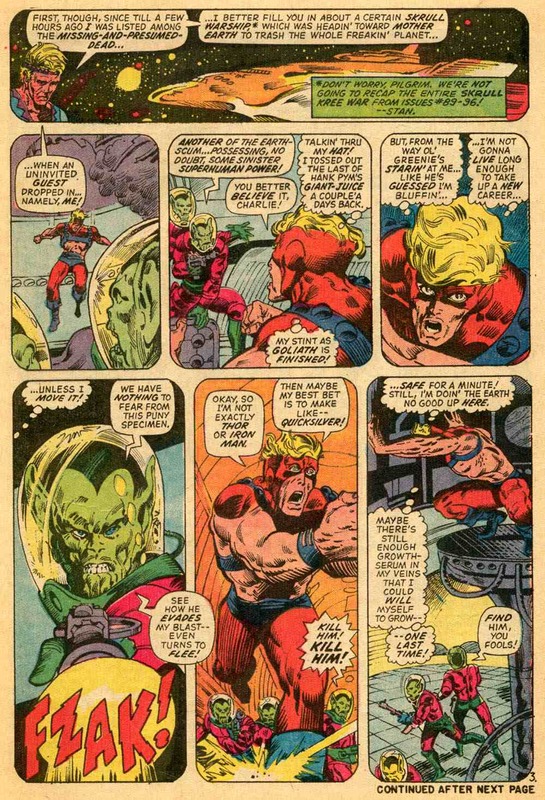 But that never stopped him from running head-first into danger, whether it be from common thugs, aliens, or gods. It never stopped him from standing nose-to-nose in an argument with Cap or Quicksilver or Hercules or the Vision. He wasn't a superhero due to superhuman abilities. 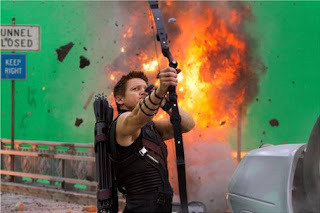 He was a superhero...an Avenger...due to his own stubbornness and courage. Clint started the Groovy Age as the familiar Hawkeye. 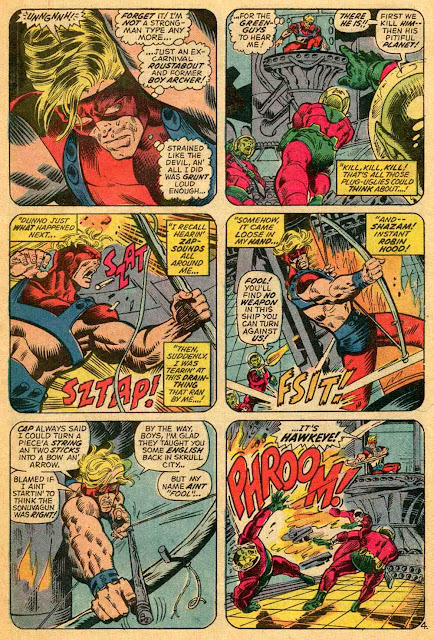 Big-mouth marksman who loved nothing better than needling Cap. 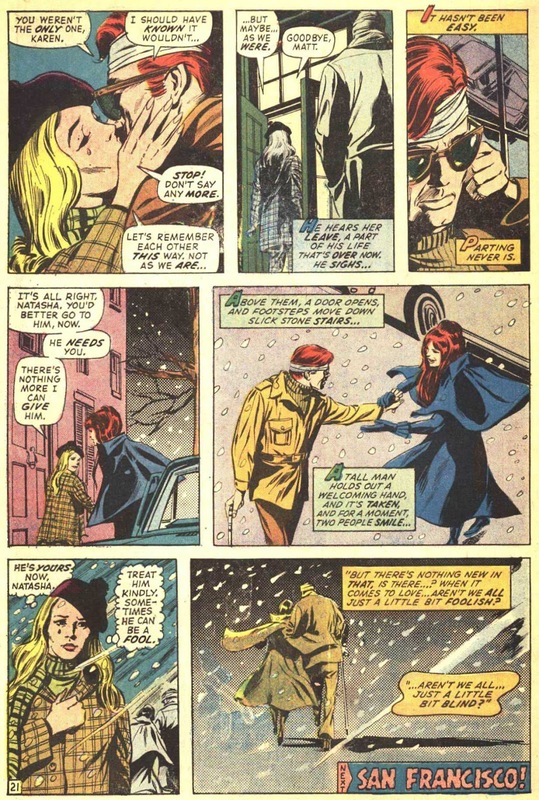 He was also in love with enemy-spy-turned super-heroine Black Widow (more on her in a moment). That love, his fear for her safety and his inability to protect her, caused him to decide to become the new Goliath after Hank Pym gave up the identity to become Yellowjacket. 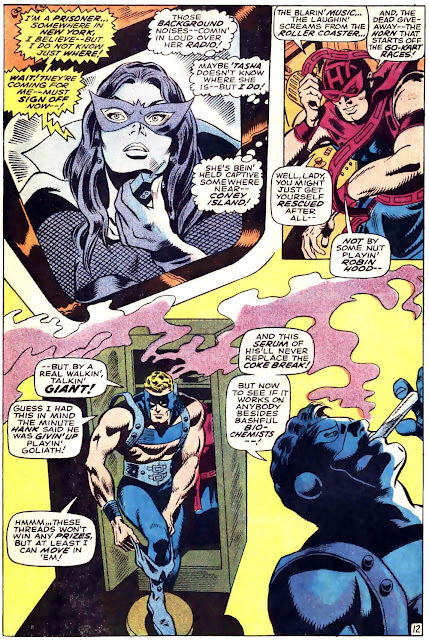 From Avengers 63 through Avengers 96 Clint had the muscle to back up his mouth. In Avengers #109, Hawkeye returned to his original, much classier, threads. 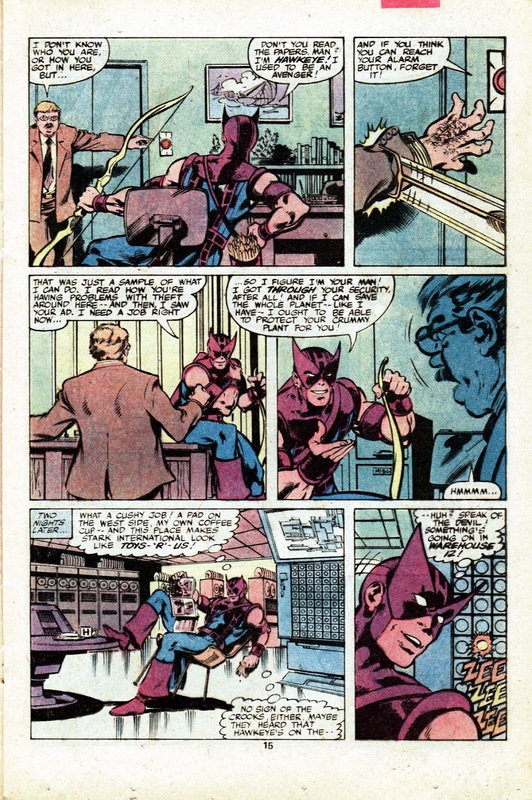 Problem was he'd also decided to leave the Avengers--which led him back to his old bad habits of teaming up with folks who turn out to be stinkers (Clint was so gullible!). 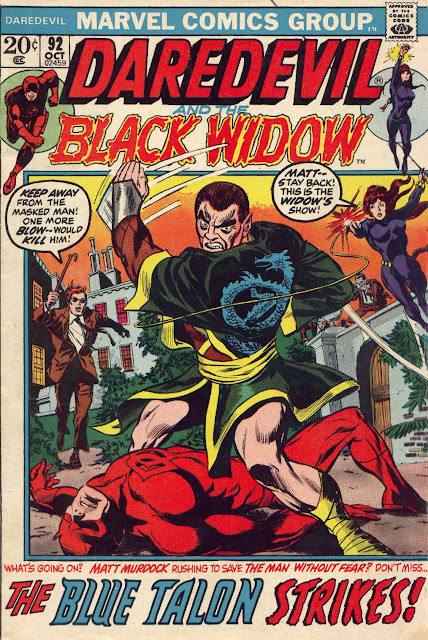 After straightening out that mess, Hawkeye bounced around the Marvel Universe, sorta teaming up with the Hulk here, Spider-Man there, fighting with Daredevil (over the Black Widow--again, stay tuned!) and hanging out with the Defenders. 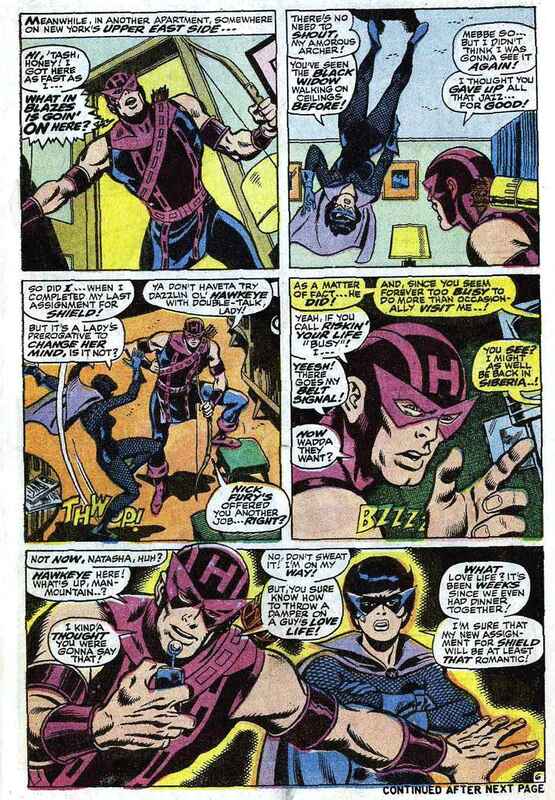 Then during an adventure in the Old West Hawkeye befriended the Two-Gun Kid who was brought to our time. 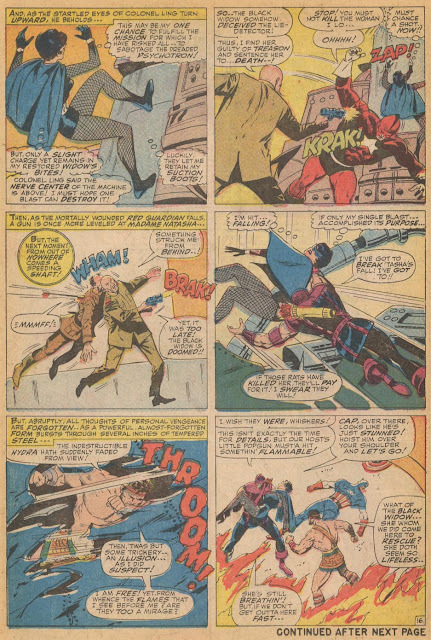 Clint decided to show the Kid the wonders of the 20th century and left the team again (Avengers 144). 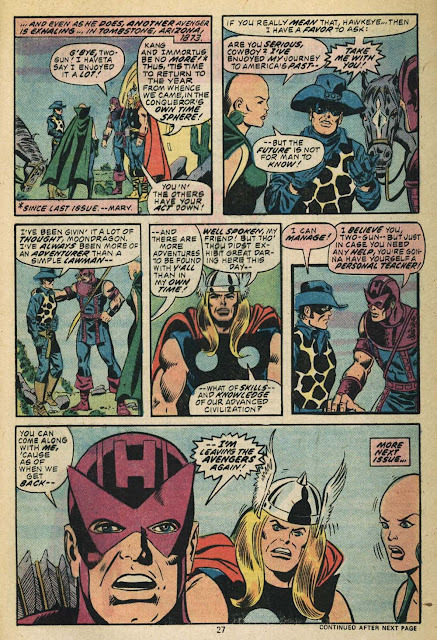 Rejoined the team one more time in ish 199, where he stayed until the Groovy Age ended. 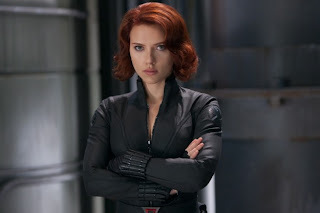 The Black Widow: It's interesting that Madame Natasha will be a founder in the celluloid version of the Avengers. Like many an Avenger, she started out as a villain, fell for Hawkeye, turned to "our" side, and joined S.H.I.E.L.D. 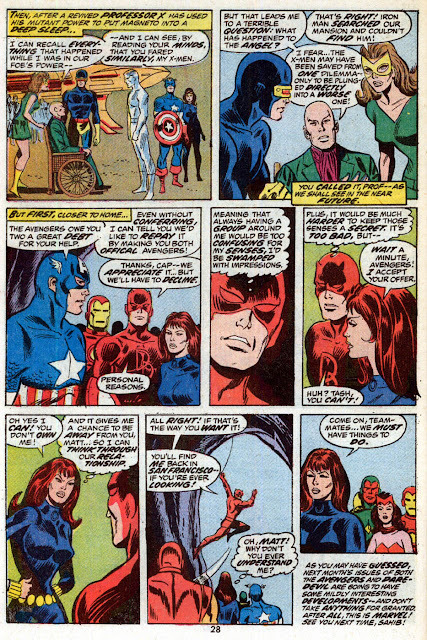 When the Groovy Age started, the Widow was hanging out with the Avengers whenever her job at S.H.I.E.L.D. allowed it--which wasn't nearly enough for a certain purple-clad bowslinger. 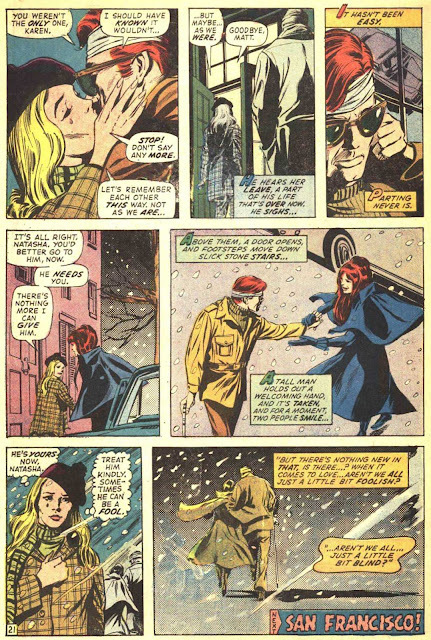 ...move to San Francisco, and the Widow would become DD's official partner in Daredevil and the Black Widow #92. And it was then, dear Groove-ophiles, that the Black Widow finally became an Avenger--for one page in Avengers #111 and one single issue, Avengers #112. 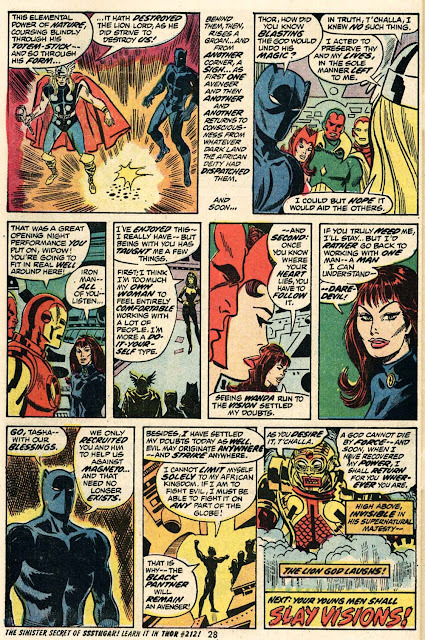 The Black Widow would become a major player in the Avengers eventually--during the 1990s--and we ain't goin' there, baby! 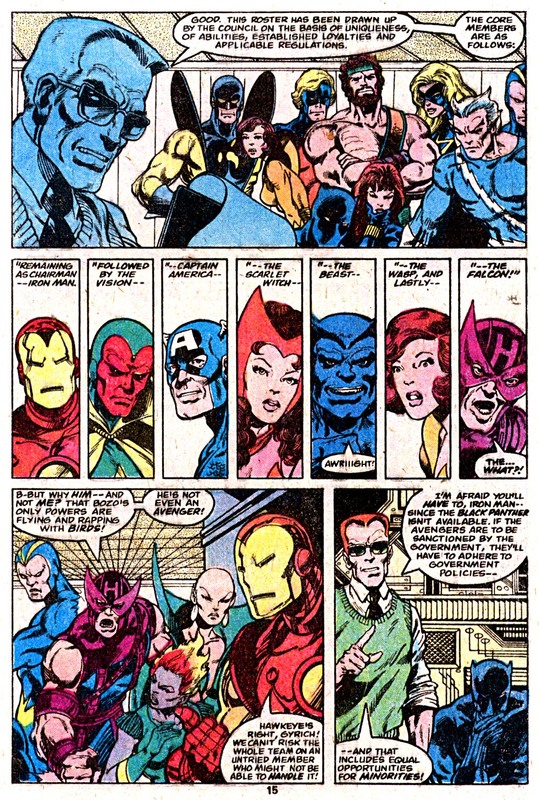 Be back tomorrow when we get a lesson on the early history of the Avengers from none other than the assemblers' (usually) faithful butler, Jarvis! AAhhh great memories! Thanks for refreshing them for me. I was always a huge Hulk as a Avenger fan. 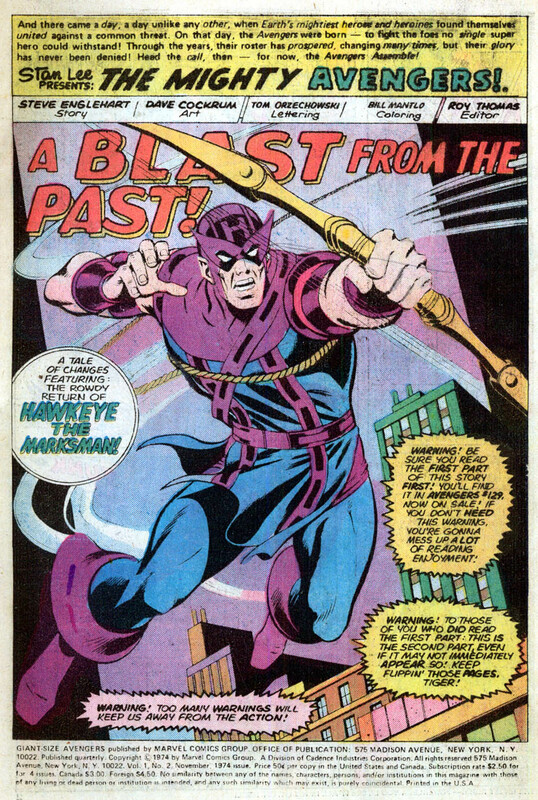 As well as Hawkeye/ Goliath fan! I agree that new costume Hawkete got in Avengers #98 was horrible! I was so happy to see it gone! As much as I loved the archer. 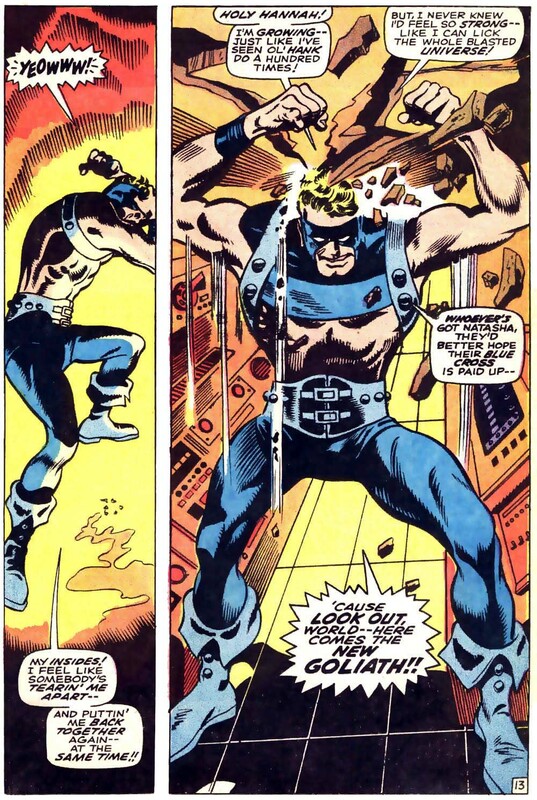 I have to admit I loved him as the new Goliath too! 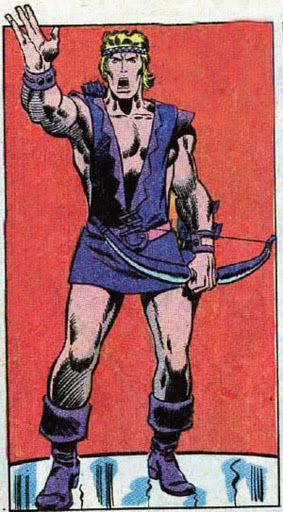 Hated Hawkeye's "native American" look! Mixed feelings when Clint became Goliath...though a fan of the Two-Gun Kid! It seemed as if Natasha went through a couple of "catwomen-like" styles over the years,which I never really noticed 'til today. 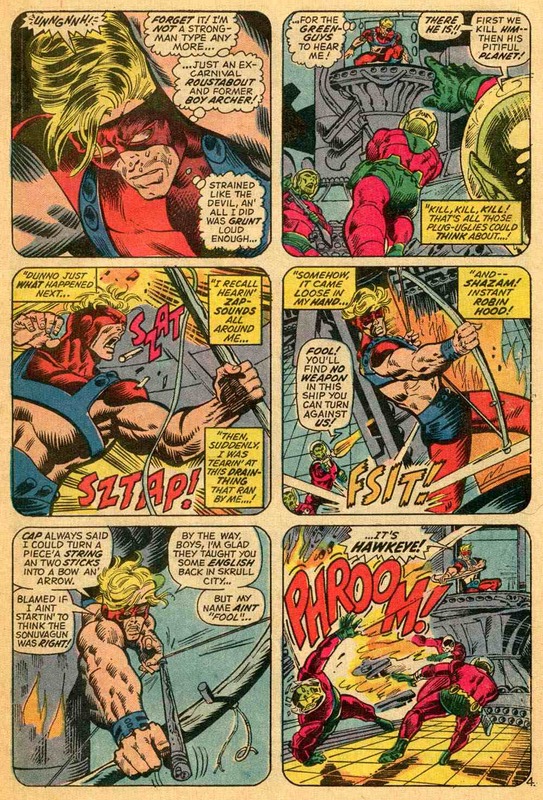 Look at that gorgeous Colan artwork.